Ludlow Methodist Church sits in the heart of Ludlow’s old town (link to ‘contact us: location’) and is a friendly and welcoming church. We aim to provide a place where people can learn about and meet God in welcoming, friendly and comfortable surroundings. With our fellow Christians in CTAL (Churches Together Around Ludlow) we aim to serve the community in all we do. 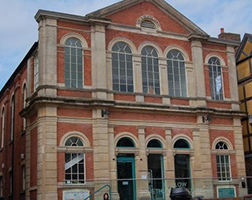 The building dates from 1879 but has been thoroughly modernised in recent years. This includes Wesley’s Cafe at the front of the building, which is open for snacks and light lunches 6 days a week. Our Minister, the Reverend Kim Stilwell came to Ludlow in 2015. 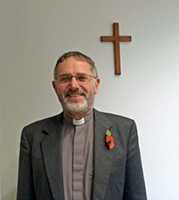 He has been a Methodist Minister since 2005. He is married to Stella and they have five children between 15 and 25 years old. He studied as an Electrical Engineer and worked at the BBC, going on to lecture in Broadcast Engineering. He became a Local Preacher in 1995, and felt a call to ministry in 2000. Together with Stella he enjoys walking, cycling and singing. 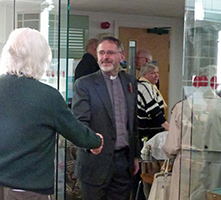 Ludlow Methodist Church is in the South Area of the Shropshire and Marches Methodist Circuit and in April 2017 joined together with the congregations of Blackford and Caynham Chapels to form one church in three locations. Blackford and Caynham chapels have served outlying areas for many years but are now only open infrequently for Sunday worship. (Link to ‘Contact us: location’). Ludlow is a thriving medieval market town with a lively community feel, busy with events and festivals throughout the year. The historic town centre is situated above the River Teme and is surrounded by the beautiful countryside of south Shropshire and the Welsh Marches. Ludlow has a reputation for the quality of its food and drink with the local area providing an abundance of quality producers. Every September the town is filled with food lovers from all over the UK, and beyond for the Ludlow Food and Drink Festival.